These soaps are made by hand using the old fashioned cold process. Our clear Sugar soaps are made with pure unprocessed Raw Cane Sugar which is a natural humectant and helps to retain moisture and cool the skin. 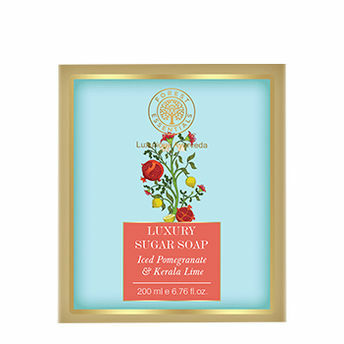 Benefits : This Iced Pomegranate with fresh Kerala Lime Luxury Soap is a clear transparent soap with Organic Cane sugar, and adds natural oils to your skin.Apart from gently cleansing your skin, it helps to keep it soft and hydrated.